KINGS LAND BOWLS CLUB (mid Jan-mid Feb 2019) – Play it again, Tiger! When it came to songs, it was more of a shower; while the Treasurer and friends knew their musical onions, and the Chairman’s table hit all the high notes and won the contest, I didn’t know whether to Keep On Running or to give up and stay in Itchycoo Park. Excellent bread, pate, and cheese revived us midway – thank you again, Jan and Jane – and thanks to all who donated raffle prizes, especially whoever put in the very mellow Merlot. It was my distinct impression that Mr Super Green won some free valeting for his combine harvester – or did I get that out of tune as well?! Chris Morris continues to do a grand job as our new Social Sec, and President Joan continues to distribute raffle tickets with the best; keep up the good work, everybody, we keep on enjoying it all! Our final Quiz Night is on Friday 8th March - will we have to face the music again?- come and puzzle your brains! Our Spring Lunch (£10) is set for Sunday 24th March; Plat, oops, I mean Chef du Jour Malcolm and his Consort of Charismatic Cooks are beefing things up again, so make sure you’ve booked your place – it’s always popular and always scrumptious. brace yourselves for our great spring match, when President Joan’s Jonquils will be in full flower against Captain Viv’s Violets! After this, the green will be open for roll-ups and Club Nights will be on Tuesdays as usual through the bowls season – whether you’re after the kitty or called to the bar, we look forward to seeing you. KINGS LAND BOWLS CLUB (mid Dec 2018 - mid Jan 2019) – Christmas (and New Year) crackers! First of all, a quick look at our Christmas Quiz and Carols; our Musical Directors Jo and John Gaynor did a wonderful job, including a carol for those who prefer to be Grumpy Old Persons rather than Merry Gentlemen. Pat Edwards kept us jumping with a hilarious group performance of the Twelve Days of Christmas – each Day saw a group of singers shooting up from their chairs like pheasants, or was it partridges? Snacks were plentiful and served by an assortment of illustrious Elves ; the Bolshie Barmen aka Martin Richmond and Rob Wheeler kept us hydrated, while Quiz-Mistress Tess kept us guessing. Another cracker! – it was much enjoyed by a full house and we were all delighted to see Kevin at the bunfight. The choruses were rousing – a most cheery lead-up to the festive season itself. Festive feelings continued with a Happy New Year Party on 11th January, again attended by over 40 members and guests. The atmosphere was so electric that several balloons burst, while conversation hit the roof and bounced back – games were played, jokes were made, and Auld Lang Syne was sung with gusto. Once again we thank all who contributed, and all the valiant members who organised this. Particular gratitude goes to our evergreen doyenne Pat Edwards with her unfailing vim and vigour, and to our Social Secretary Chris Morris – it’s not just the weather that brings people in, dear Soc Sec, it’s the great atmosphere you and your team are creating! Thanks as always to Catering Queen Irene and trusty assistants, including our Chairman undercover as a sous-chef; and to Alison Parker Morgan and President Joan ( also undercover as a ticket tout). We rejoiced to see Tess and Kevin dispensing good cheer together at the bar – he certainly Played His Cards Right. Yours truly was delighted to be included at a table where so many deserving cases won raffle prizes, and to conquer the Sweetie Quiz (dear me – surely life is more than Candy Floss!) with the well-known Guess-Right Gaynors. Excellently done, all and sundry, we are blessed to have you beavering away…oh alright, Jimmy, rats and pigs included. Time is rolling on, folks – only three months to outdoors, and counting … meanwhile our Curry Night on 25th January is guaranteed to turn up the heat; there’s a Quiz on 8th February, so brains in gear, folks – then mouths in shape, as we have the Soup & Pud Night on 22nd February. Our final Quiz Night is on 8th March. We also hope to have our usual Spring Lunch in March, date to be confirmed shortly. 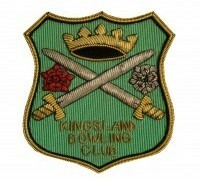 KINGSLAND BOWLS CLUB (mid Nov-mid Dec 2018) – elves and pastry! Winter events have been as entertaining as always; an enthusiastic crowd gathered for an evening of Pig-Racing on 23rd November, courtesy of Pigmaster General Jimmy, and his able lieutenants Jane, Margaret and Chris, not to mention Henry. Unfortunately (though I am only an occasional pig when pavlova and potatoes – no, not together! – beckon) I had to race off early, but gather that a good time was had by one and all. Meanwhile, we were shocked to learn that our Competition Secretary Kevin had met with quite a serious accident, and was temporarily down and out. We wish him all the best with his recovery, and hope to hear Delilah ringing round the club again soon – I mean, of course, the song, not some dangerous shady lady on a smartphone – we all know how capable Tess is and we send them both our sympathy and our regards. On 5th December, our Annual Christmas Bingo went with a swing at the Coronation Hall; once again we had a full house, and we would like to thank the donors for the tasty mincepies and the excellent spread of prizes. Social Sec Chris Morris did a grand job of calling, aided by his lovely assistant Viv Webb. Thank you also to the elves in the kitchen, those who lugged hampers to the lucky winners, to the hard-working ticketing team, and to all who assisted and attended - this event is always popular, and contributes substantially to the success of the club. Close on the heels of the Bingo came the KBC Christmas Lunch (9th December) – 49 members and guests sat down to a sumptuous festive spread; Chef Supreme Morgan and team (Pat, Irene, Jo, John, Rob, not forgetting setters and servers) who needs the Bake-Off when you can talk turkey? – it was a triumph, and there was nothing flaky except the lovely little pastries. Thank you for your time and trouble, you deserve several medals! There was a splendid buzz of conversation – until the raffle started and you could have heard a pine-needle drop. (Actually you couldn’t, as Barry James kindly supplied us with a Nordman, and Chris Richmond decorated it most attractively.) The usual suspects (hello, President Joan!) had winning tickets – and there were numerous prizes to be won, so more gratitude to all who contributed. Now we look forward to a new year and a new season – but we’ve still got more fun to come indoors. Our New Year Party will welcome in 2019 on Friday 11th January, while it’s never too chilly for chilli at our Curry Night on 25th January, and there’s a Quiz coming up on 8th February. On a more sober note, it’s nearly subs time, folks; these remain as last year (£70 for Full Members, £15 for Social Members). KBC wishes all members and friends a Peaceful, Playful and Prosperous 2019!